Update Feb 26 2014 This is a update and a few words about dealing with authentication companies like PSA/DNA and JSA. First they both can be a VERY frustrating to work with. All you are getting a their educated guess! If they turn something down it does not mean it is NOT authentic. I recently sent PSA/DNA 32 items along with $1400 and all of them I felt there was no questions about them being authentic. Out of the 32 items 13 were returned to me as not passing. For example, I met 1946 Herman Keiser several times and was personal friends with is daughter. 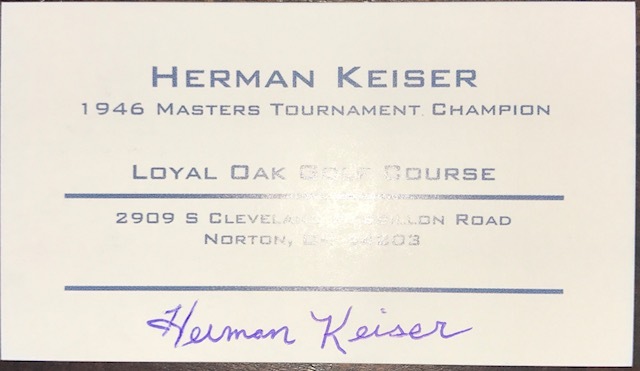 I got him to sign several Masters scorecards for me in the mid 1990's. I sent them to PSA/DNA and I just got them back as NOT AUTHENTIC! They kept my money and they say sorry they are NOT AUTHENTIC! I know they are authentic. Last word about authentication companies. I guess they are a necessary evil. And they fail these!! ?? There is another awesome golf collectibles website www.scottishgolfmuseum.co.uk There are tons of images and a lot of hard work has been put into his website from this passionate collector It's a great site Gary Congrats. A great site about Tournament Used Scorecards. They have some for sale!